NOTHING HAS BETTER SPEC FOR PRICE. Think you found something better? Email us at bd4salesteam@aol.com ! Shipping Address: Please ensure your address is correct when you order. Last minute changes incur delays and/or extra costs. Your address can be changed on the 3rd page of checkout. Click on "change" beside the address. NOTE: Well Equipped with DT SWISS Tubeless Compatible Rims! Bikes are Now Only $2999 Price Will Go Up Soon and will sell out. NOTHING HAS BETTER SPEC FOR PRICE OUT THERE. Think you found something better? Email us at bd4salesteam@aol.com ! 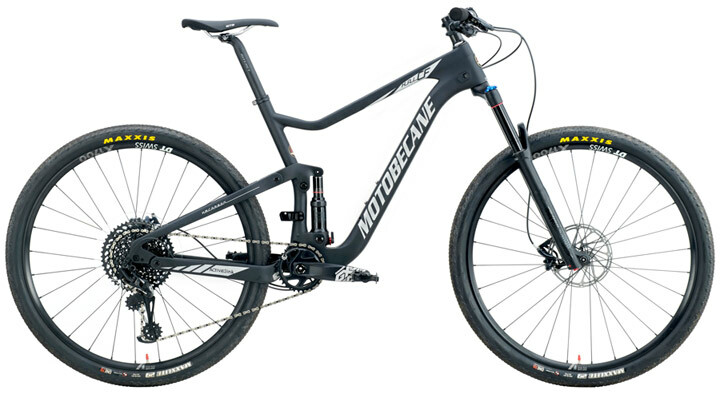 This is the much anticipated Advanced, Engineered, FULL Carbon, Full Suspension with Boost Axles HAL Boost (Highly Active Linkage) by Motobecane USA. Building upon over a decade of FS design, this HAL BOOST 29/27+ Full Suspension is designed for up to 5 inches of terrain taming travel both front and rear. The HAL Linkage uses a chainstay mounted pivot for even more supple suspension tracking and incredible control even while applying the brakes. Chainstays are optimized on the HAL Boost models for incredible Billy Goat climbing and traction. 140mm travel, weigh approx 24lb (SL version) to around 28.5lbs (config tubeless, see tubeless FAQ) (On Sale $2999). Component choices are smart…great value bike on the new 29er wheel size….best deals and components to deliver a solid package…models shipping now have an updated rear shock called the Monarch R rear shock with Fast Black 7075 shaft and Rapid Recovery rebound damping…this rear shock has excellent, supple performance and has very good mid-stroke damping support. A high level of engineering and attention to detail is seen on all Motobecane mountain bikes.This video is of the 29er, cousin to the much anticipated Full Suspension 29er/650B by Motobecane USA. Imagine the trails you will dominate with fast rolling and massive traction 29er Tires and a Rockshox Reba RL 140 up front with up to 5.5 inches of travel in the rear. Test riders Compare the HAL Boost to other Full Suspension bikes. They say the HAL Boost is a turbo-charged Dakar Rally car and the 29er verision is lighter and rolls even faster. No corners are cut, the HAL Boost CF 29 SRAM 1x12 has top-of-the-line Full Race specs. A 140mm Rockshox 29er Boost fork with up to 140mm of travel + in the rear, the NEWEST Rockshox DELUXE Air rear shock with Rapid Recovery Rebound Technology. HOT NEW DT SWISS Tubeless Compatible wheelsets. New Spline hub with 'Ratchet System' freewheel, which has already been used and tested by rider Nico Lau in the Enduro World Series. The full Eagle drive train is race proven. An sealed bearing headset, proven Sealed Bottom brackets. Advanced SRAM EAGLE 1x12 drivetrain with Eagle 1x12 clutch rear derailleurs and incredible SRAM LEVEL Hydraulic brakes and levers. With the HAL Boost's stock 29er Maxxis Pro level tires you can hang with virtually anything on the trail. No worries about dealing with a Fat bikes super wide BB, these crank/pedals are no wider than a normal bike. Now in Warp Speed! This 29er model Comes with 29er Boost Wheels/Tires for a warp speed 29er Boost Enduro / XC Rocket! Capable of fitting your own 27.5PLUS wheels/tires if you want super flotation/traction for sloppy mud or snowy conditions too! 41cm - 5'6" to 5'8"
44cm - 5'9" to 5'11"
48cm - 6' to 6'2"